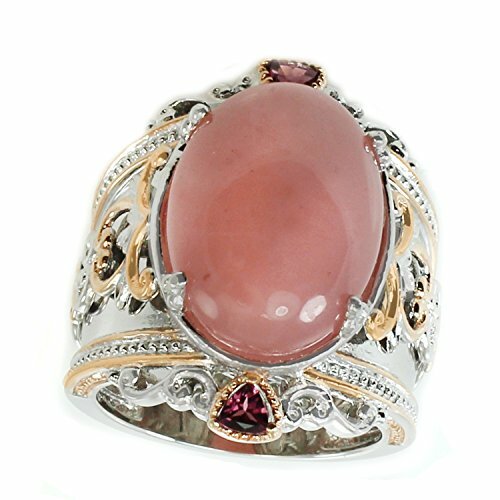 This exquisite Michael Valitutti ring features oval cabochon Pink Chalcedony (18x13mm) accented by trillion Rhodolite (3mm) 0.2ct. Crafted of palladium silver with a beautifully-constructed undergallery and 18k rose gold-embraced detailing, this ring shines with a highly polished finish. Two trillion Rhodolite (3mm) 0.2ct. If you have any questions about this product by Michael Valitutti, contact us by completing and submitting the form below. If you are looking for a specif part number, please include it with your message.